The DVDs in this pack each contain 16 episodes of That's a Fact. 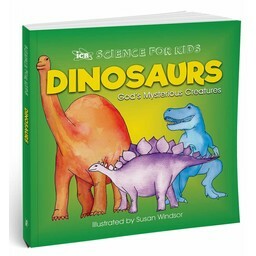 Enjoy learning about God's creation and the evidence for his design! Delivery time: Most items ship within 24 hours! 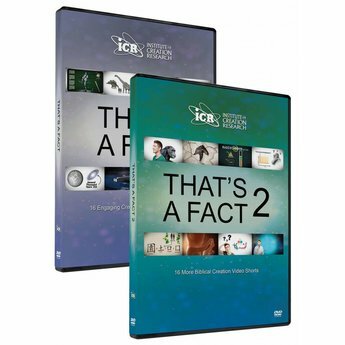 Each video - in two minutes or less - showcases one truth about the Bible, creation, and science. The collection of 16 videos covers a variety of topics in a fun, visual, and engaging format! That's a Fact makes you think about scientific discoveries and how they relate to the Bible. If you prefer, this resource, That's A Fact, is also available in digital form and can be downloaded now. 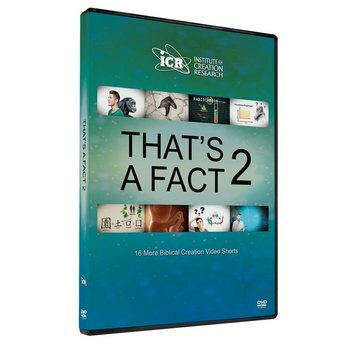 Sixteen more That's a Fact video shorts packaged together in one educational DVD. 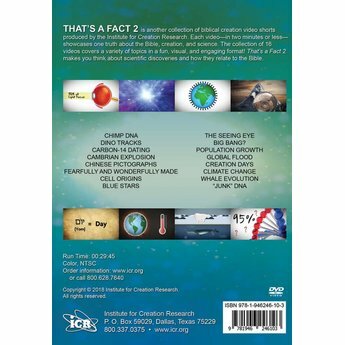 That’s a Facts 2 is another collection of biblical creation video shorts produced by the Institute for Creation Research. 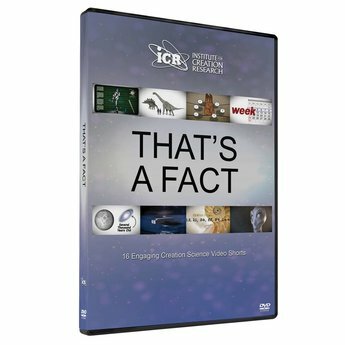 Each video – in two minutes or less – showcases one truth about the Bible, creation, and science. The collection of 16 videos covers a variety of topics in a fun, visual, and engaging format! 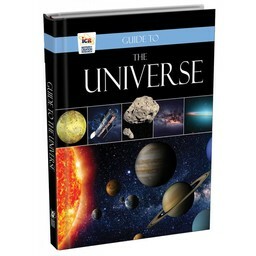 That’s a Fact 2 makes you think about scientific discoveries and how they relate to the Bible. If you prefer, this resource, That's A Fact 2, is also available in digital form and can be downloaded now. Total Shipping Weight: 6 oz. These are the best, most challenging series of short videos on the creation verses evolution debate. 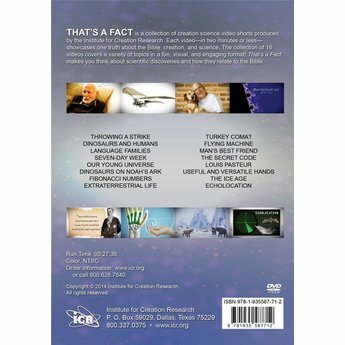 I have asked ICR for years to put them on a DVD and sell them. I was thrilled to see them offered in their store, I am ordering my set today. They are extremely well done, short videos that challenge the thought process of anyone willing to listen. They have been produced in such a way that they cause even the most argumentative listener to go back and research what they have been taught. Thank you to the producers of these videos and thank you ICR for making them available on DVD, I promise I will wear mine out showing them to people.